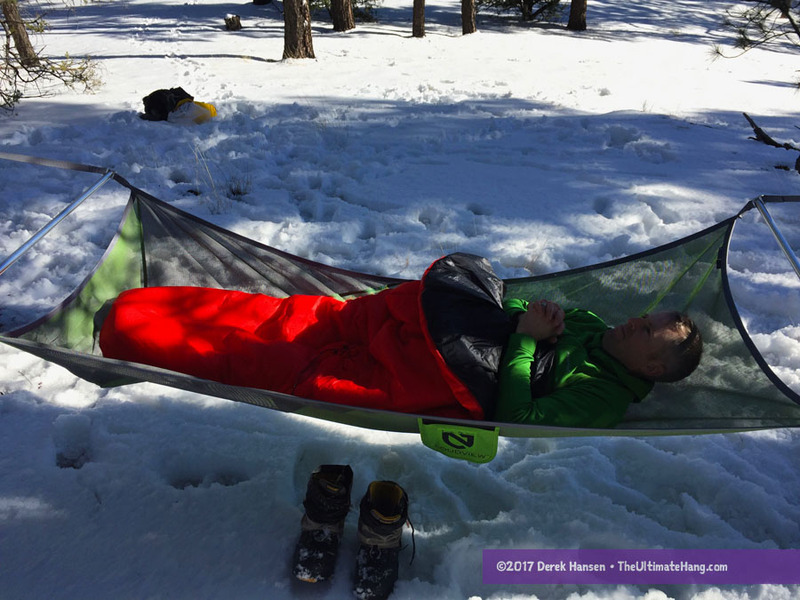 The Sestrals Poncho is an all-in-one sleeping quilt, blanket, and insulated poncho with a built-in head opening. 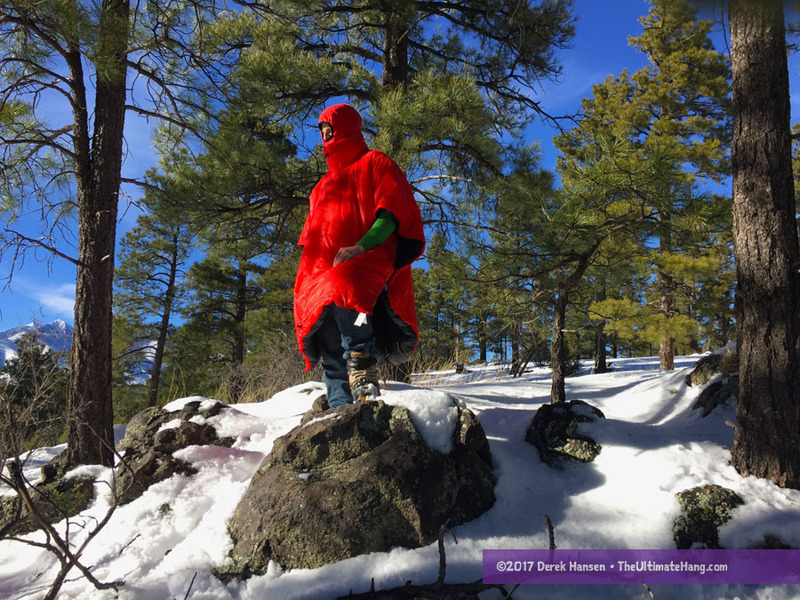 The poncho is insulated with Climashield® APEX, a continuous-filament polyester batting. The ultralight 12d nylon fabric shell is treated with Schoeller-FTC with Ecorepel finish, which claims a water and mud-repellent finish, while also being biodegradable and free from fluorocarbons (PFC). The foot area can be snapped shut to form a box. The snaps pair together both in quilt mode but also when converted into a poncho so the sides can snap together. This also allows for two quilts to snap together to make a sleeping bag. The footbox drawcord is designed so the end completely seals shut, unlike other quilts that often leave a small hole. When used as a poncho, the Selstrals has a unique insulated collar that prevents drafts. The collar also acts as a minimalist seal when used as a quilt. While sold separately, the Sestrals Balaclava is the perfect pairing for the poncho. It uses the same fabric, coating, and insulation as the poncho. It’s very light, due in part to the simple design and lack of added snaps, zippers, or hook-and-loop fasteners. Elastic shock cord loops hook under your arms to keep the balaclava snug on your head. A single round porthole provides just the right apature for breathing. 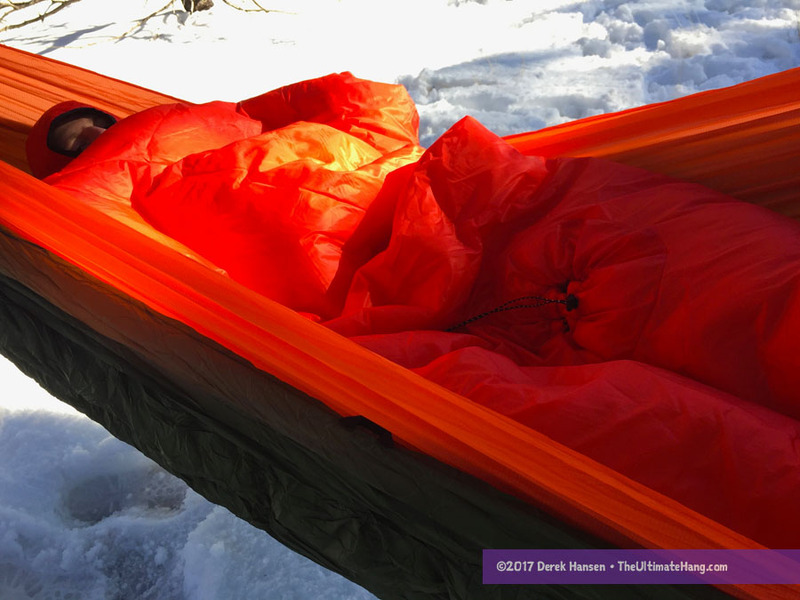 As far as synthetic top quilts go, the materials and construction is very good. The construction is simple, but well done. Most synthetic-filled quilts do not need much quilting, which is a benefit in some ways because that means fewer cold spots due to sewing. However, the fabric can feel a little billowy because it isn’t attached to anything but the edge seams. The poncho doesn’t have any snaps or loops around the head end, which means wrapping or securing the shoulders is freeform. In talking with the company, this is their preferred method as they like to tuck their head under the insulation. The quilt is plenty wide (between 51 to 55 in (130 to 140 cm)), so tucking in should be easy for most. This is the one element on the quilt that I didn’t care for. For a cold-weather quilt, I like being able to snap and cinch up the head end so I can “hook” it around my head to prevent drafts and have a more secure closure. My quilt was filled with the APEX 200, which is rated by the company down to 23°F (-5°C). 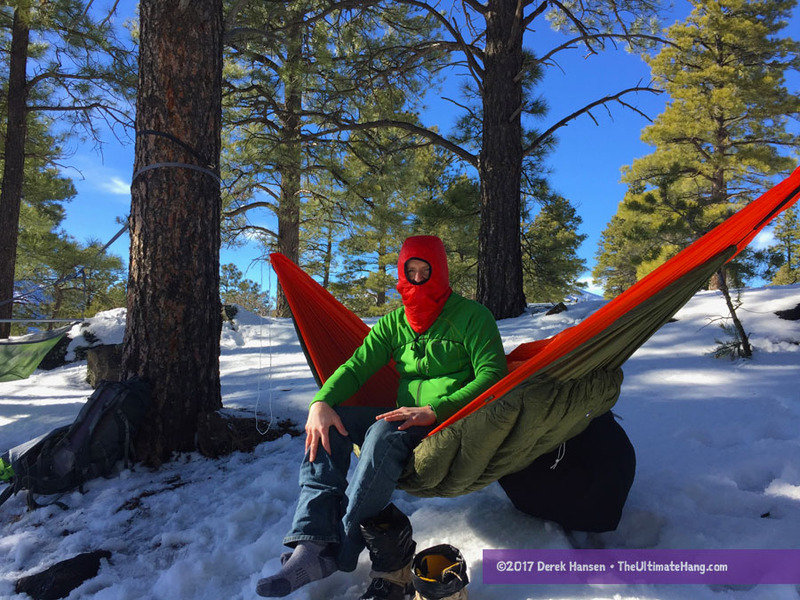 I’ve tested the quilt down to 32°F (0°F) and stayed warm. The quilt can also be used as a liner to boost another quilt for colder conditions. The hood is pretty hot. It uses APEX 67, a little thinner than the quilt, but it’s plenty effective. I often perspired in the hood, so using it for much colder situations is ideal for me. It also packs down small — about the size of a (lumpy) baseball. At only 1.5 oz, it’s an easy choice to take on any trek. I found that I roll up the hood and wear it as a beanie. This provided more visibility when walking around, and then I could pull it down into the full hood when it was time to snuggle up and sleep. Very versatile. Construction and Craftsmanship ♥ ♥ ♥ ♥ ♥ High-quality construction and materials used. The ecorepel is a nice touch. Modularity ♥ ♥ ♥ ♥ ♥ I really like modular quilts. 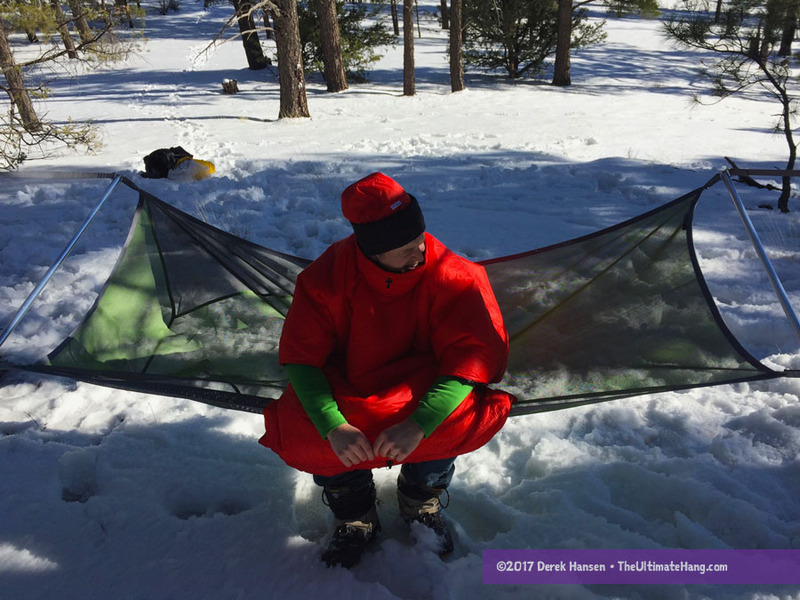 The basic rectangular construction offers lots of possibilities, but the fact that it converts into an insulated poncho means the quilt can be used more efficiently. Price and Value ♥ ♥ ♥ ♥ ♥ A little higher priced for a synth quilt, but it is imported for the US market. Previous: Previous post: Thank you for your patience!